Say hello to one of the world's best mini hookahs - the Furat Egyptian Hookah. Standing just 16 inches tall this handmade Egyptian hookah pipe packs quite a punch. Search far and wide and you will see that the Furat has no equal. We are 100% confident that for it's size, this is the world's best hand crafted Egyptian hookah. Most other mini hookahs are low quality or machine made. The Furat hookah is 100% hand made in the traditional Egyptian style and features a sturdy glass base. Load up your favorite flavor and add some coals and we think you will be amazed with the volume and quality of smoke that the Furat cranks out. Whether it be a travel hookah, a mini hookah to keep on your desk, or just a gift for a friend who doesn't own their own hookah yet, the Egyptian Furat is an excellent choice and one of the best values on our site. Your new Egyptian Furat hookah will come with a glass base (your choice of color), a washable hookah hose, a small Egyptian clay hookah bowl, and all of the grommets necessary to ensure an air tight seal at all hookah connection points. 16" Furat Egyptian Hookah has a average rating of 0 stars out of 5 stars based on 0 reviews. All of our Egyptian products are handmade in a traditional manner and are not produced off of an assembly line. Because these hookahs are handmade, there are usually slight variations from hookah to hookah. 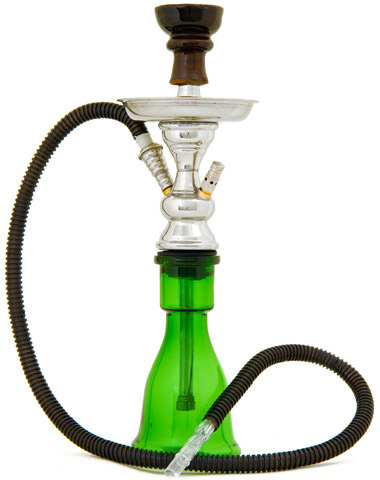 Some hookahs contain visible weld lines or unpolished metal at the welds. Glasses are also hand painted and may have slight variations from the glass shown in the picture. Egyptian hookahs are for people that appreciate the look and feel of handcrafted products. However, they may not satisfy someone looking for a flawless hookah that was made with modern machinery.